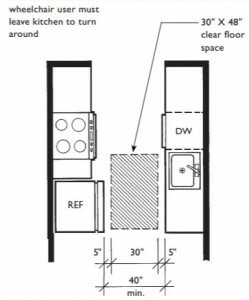 606.2 Clear Floor Space Exception 1: A parallel approach complying with 305 shall be permitted to a kitchen sink in a space where a cook top or conventional range is not provided, and to wet bars. The Texas Department of Licensing and Regulation issued a bulletin whichdefines “kichen sink” And another technical memo that explains when this exception can be taken and when it cannot. This newsletter will explain it as well. 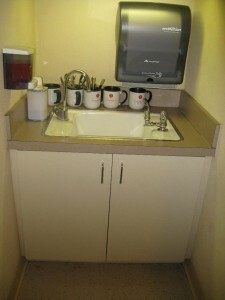 Does my sink at a break room have to have a knee space? It depends (don’t you love that answer?)….. 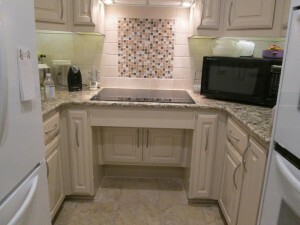 -Kitchen: A place (as a room) with cooking facilities. -Kitchenette: A small kitchen or alcove containing cooking facilities. 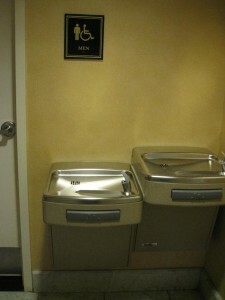 -Wet Bar: A bar for mixing drinks that contains a sink with running water. 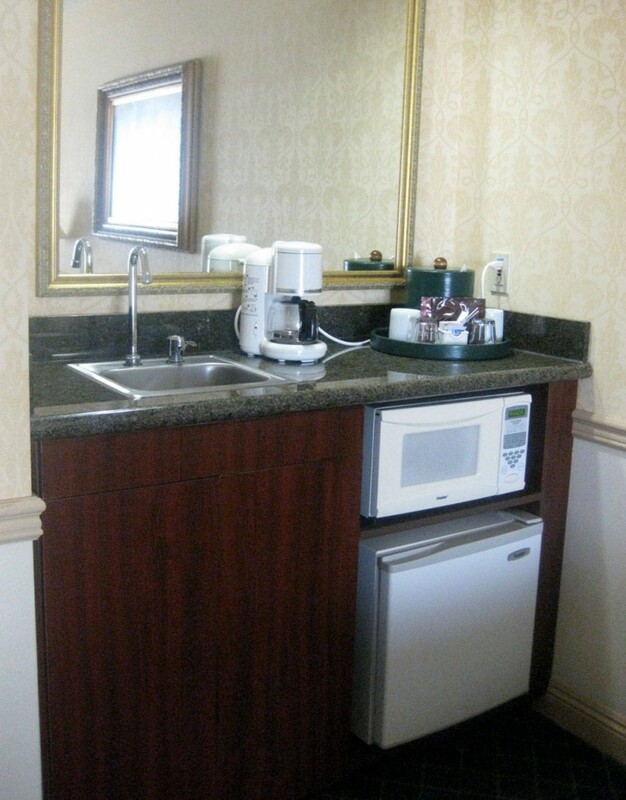 -Cooking Facilities: Fixed or built-in range, cook top, oven, microwave, or convection oven. -Fixed Appliance: When attached to a cabinet, shelf or other surface or to a gas supply. -Built -In Appliance: When cabinetry design or location of utilities (i.e.. gas supply or 220V electrical outlets) creates a dedicated shelf or space for the appliance. So, if a break room has no fixed “cooking facilities” within, then it is not considered a “kitchen” and therefore it must have a proper knee clearance at the sink. This break room has a microwave in a shelf, but it is not fixed or built in. 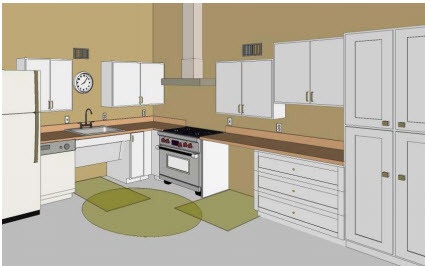 Because it is not considered a “fixed cooking facility”, this space is not a ‘kitchen” and the sink will require a knee space. If on the other hand, the break room has a fixed cooking appliance, like a fixed microwave, wall ovens, or a range, then it is a kitchen. 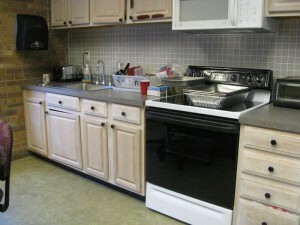 If it is a kitchen and has a cook top or a range, then a knee space at the sink will be required. 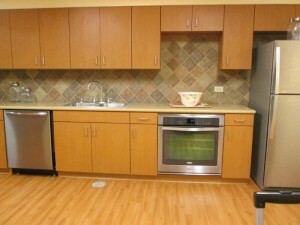 This break room is a kitchen because it has both a range and a fixed microwave oven. 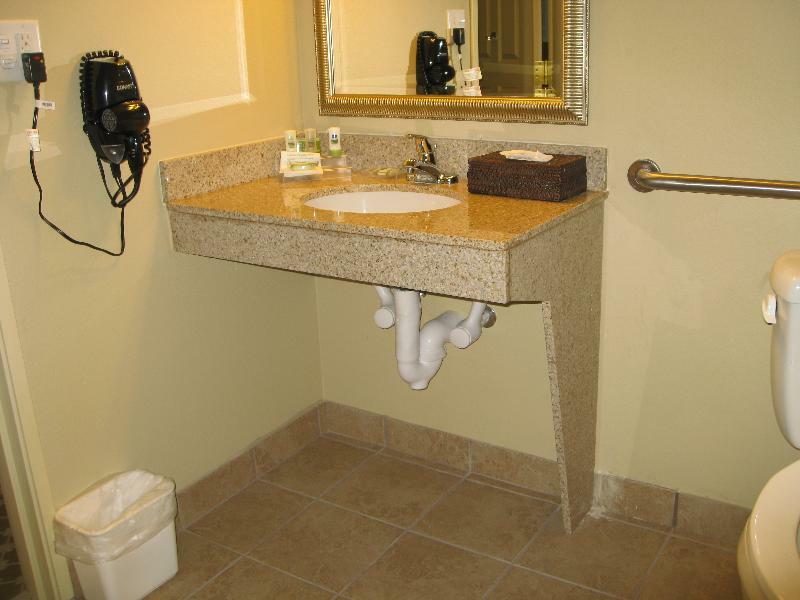 Therefore the sink must have a knee space. 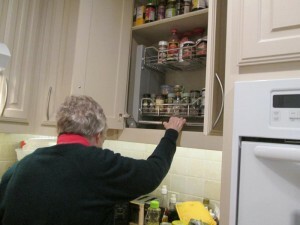 In addition, all appliances must be accessible, and 50% of the shelving must be within reach. This breakroom should follow section 804 for kitchens. But if the break room has a built in microwave or oven, then it will still be considered a “kitchen” but now the sink can take the exception and have a parallel approach rather than a front approach. According to Exception #1, another location where a knee space at a sink is not required is at wet bars. Wet bars is a place where drinks are mixed.They are typically found either at hotels or sometimes even at waiting rooms. 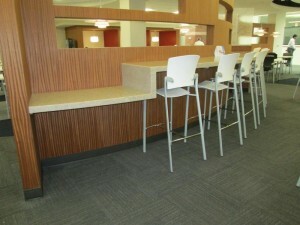 According to TDLR, a break room is not a wet bar. Sinks that are part of a “work” area and only used for work related things, like a commercial kitchen, teacher’s work room, medical labs etc., are exempted from having to comply. In kitchens when there are counters facing each other all the standards require a certain amount of distance between the counters, depending what kind of kitchen it is. The ADA, ANSI and FHA have similar requirements, but this newsletter will describe the small differences that might get us in trouble if we don’t understand them. 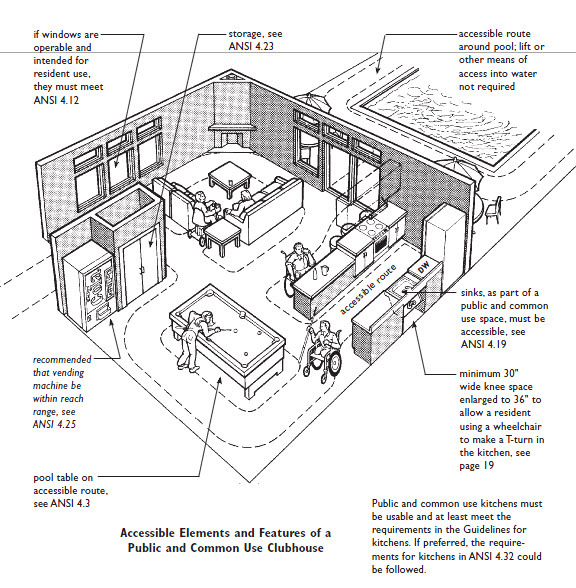 What does the Fair Housing Act Design Guidelines require at accessible counters in kitchens? There are two types of kitchens described in the Fair Housing Act: Parallel or U-Shape. 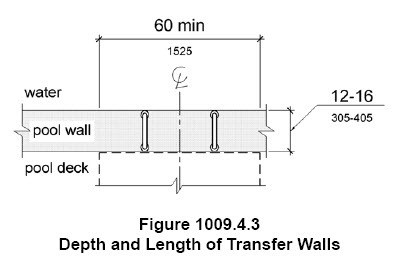 The parallel or pass through type kitchen requires 40″ between counters. This is measured between counters not the base cabinet. A question arises when appliances are located within the counters, like a refrigerator, which extends a bit beyond the counter’s depth. 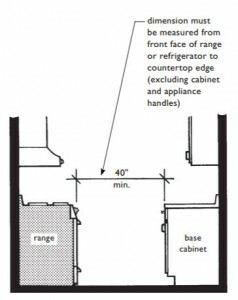 The guidelines will require that the 40″ clearance be measured at the appliance face, exclusive of the hardware and handles. 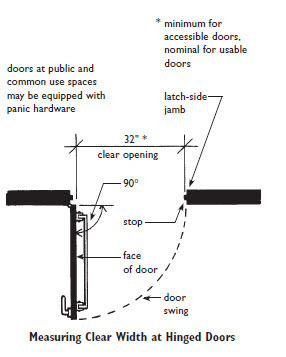 What does the 2009 ANSI design guidelines require? 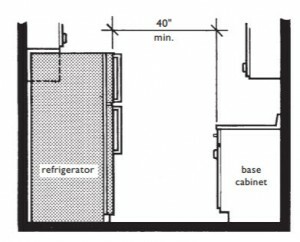 Just like the Fair Housing Act Design Guidelines, the ANSI Standards also requires 40″ at the face of the base cabinet, counters or applicances at a pass through kitchen. 804.2.1 Pass-through Kitchens. 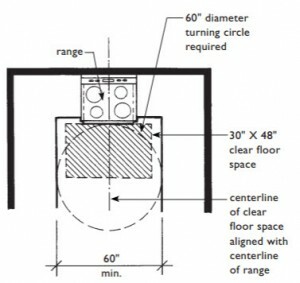 In pass-through kitchens where counters, appliances or cabinets are on two opposing sides, or where counters, appliances or cabinets are opposite a parallel wall, clearance between all opposing base cabinets, counter tops, appliances, or walls within kitchen work areas shall be 40 inches (1015 mm) minimum. Pass through kitchens shall have two entries. b) The second difference is that the ANSI does not stipulate that the clearance should not be measured from the face of the hardware. 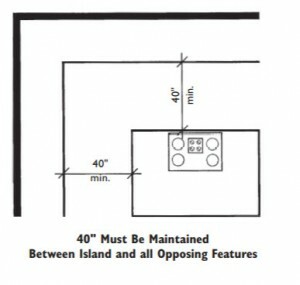 The requirements for the U-Shape kitchen is only for 60″ between counters. There is no exception for a narrower or wider kitchen. Below the 2009 ANSI A117.1 Standard figure. 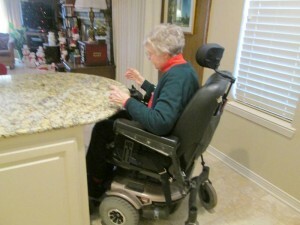 What does the 2010 ADA Standards for Accessible design require? 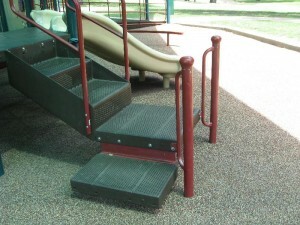 A work place can be complicated to understanding as it pertains to the requirements for accessibility. Some spaces in work areas are exempted while some require full access. Because the ADA requires that a person with disabilities is given the same opportunity to seek employment, an employer may not decide that his establishment will not employ persons with disabilities, and therefore will not make the work areas accessible. 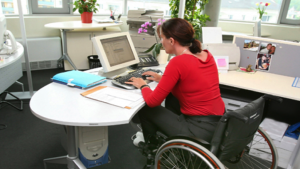 So what does the ADA require the employer to provide? This newsletter will give an overview of what requirements exist in the ADA about work areas and when the ADA Standards apply. 203.9 Employee Work Areas. Spaces and elements within employee work areas shall be designed and constructed so that individuals with disabilities can approach, enter, and exit the employee work area. 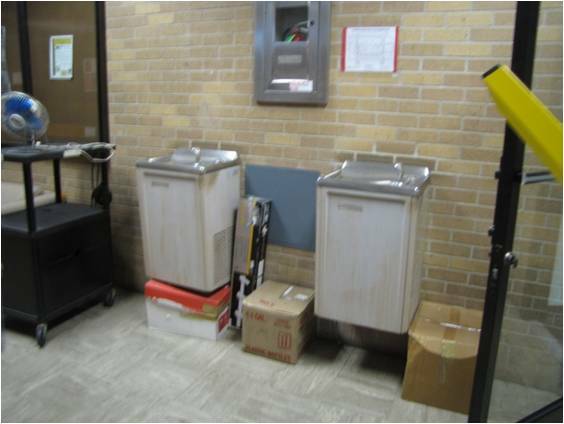 An example of a work area that only requires an approach, enter and exit would be a janitor’s closet. 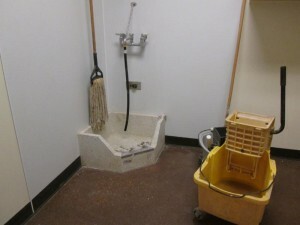 Elements within the janitor’s closet such as the faucet for the mop sink will not be required to comply. 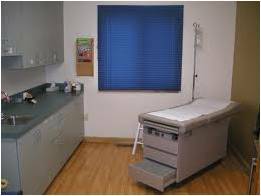 An exam room is partially a “work” area and partially a “patient” area. 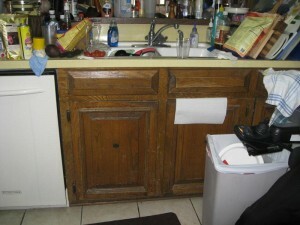 The area that is only used by the doctor (the sink) will be exempted from having to comply. 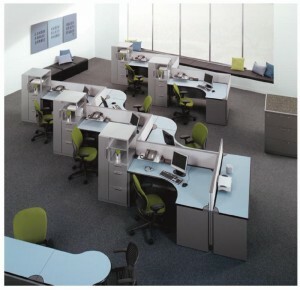 Employee work areas, or portions of employee work areas, other than raised courtroom stations, that are less than 300 square feet and elevated 7 inches or more above the finish floor or ground where the elevation is essential to the function of the space shall not be required to comply with these requirements or to be on an accessible route. 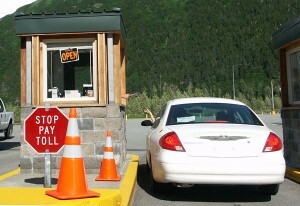 This toll booth is less than 300 s.f. and elevated more than 7″ a.f.f. and therefore do not require an accessible route to it or the ability to approach it and enter it. Advisory 203.9 Employee Work Areas. 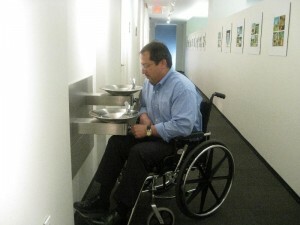 Although areas used exclusively by employees for work are not required to be fully accessible, consider designing such areas to include non-required turning spaces, and provide accessible elements whenever possible. 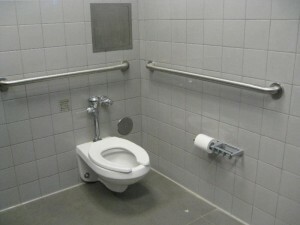 Under the Title I of the ADA, employees with disabilities are entitled to reasonable accommodations in the workplace; accommodations can include alterations to spaces within the facility. Designing employee work areas to be more accessible at the outset will avoid more costly retrofits when current employees become temporarily or permanently disabled, or when new employees with disabilities are hired. 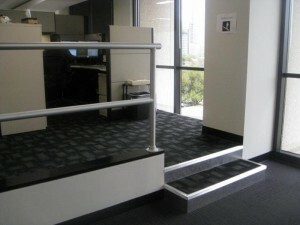 In addition to approach, enter and exit, the employee work area shall also comply with the following sections of the ADA Standards: 206.2.8, 207.1, and 215.3. These will be explained in detail below. The circulation path should meet the requirements for ADA Section 402 which includes a minimum 36″ width along the circulation path. 1. Common use circulation paths located within employee work areas that are less than 1000 square feet (93 m2) and defined by permanently installed partitions, counters, casework, or furnishings shall not be required to comply with 402.2. Common use circulation paths located within employee work areas that are an integral component of work area equipment shall not be required to comply with 402.3. 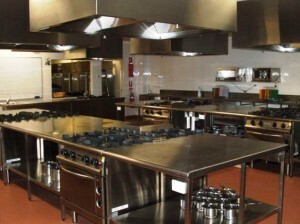 This commercial kitchen has equipment that is an integral part of the work area. The 36″ min. 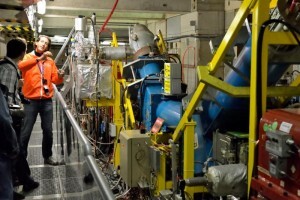 circulation path in this space is not required to comply due to the location of the work area equipment. Exception 2. Large pieces of equipment, such as electric turbines or water pumping apparatus, may have stairs and elevated walkways used for overseeing or monitoring purposes which are physically part of the turbine or pump. 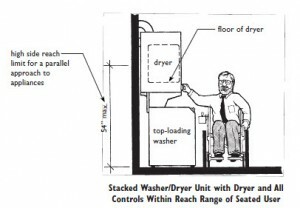 However, passenger elevators used for vertical transportation between stories are not considered “work area equipment” as defined in Section 106.5. 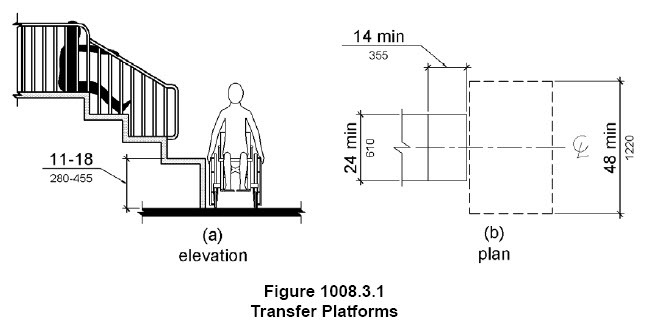 An accessible route/circulation path up to the elevated walkway used to monitor work area equipment is not required to be provided. Common use circulation paths located within exterior employee work areas that are fully exposed to the weather shall not be required to comply with 402. A dumpster is considered an extension of a work area. 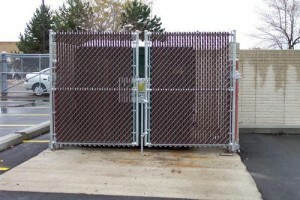 Although a circulation path within the work area might be required, because the dumpster is located on the exterior and fully exposed to the weather, a circulation path will not be required. The sink in this break room and the height of the counter are required to comply. The microwave shown in this photo is not permanently attached and therefore the reach range is not required to comply. 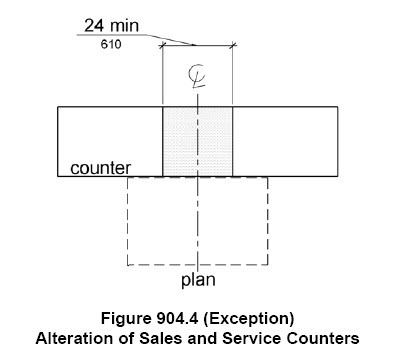 5% of the dining counter is required to be between 28″-34″ a.f.f. and provide a knee space like the photo above. 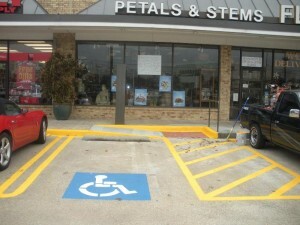 Parking that is designated for employees should have accessible spaces as well. 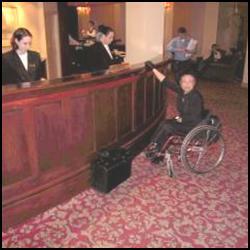 Experience what it is like to have a disability and be in a work space. 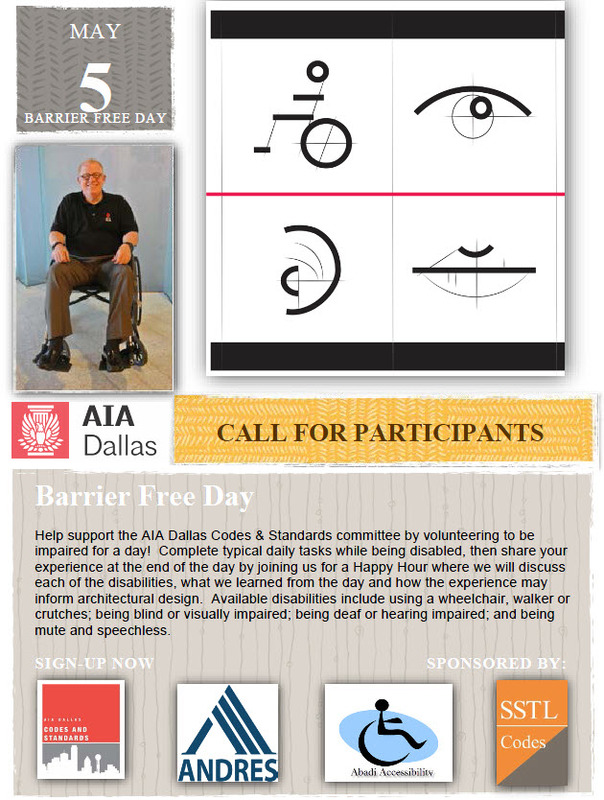 The AIA Dallas Codes and Standards Committee is having their annual Barrier Free Day this May 5th. If you would like to participate, please sign up today. If you would like to just get a 1 hr. Barrier Free CEU, join us at the happy hour where participants will share their experience of their day with a disability. 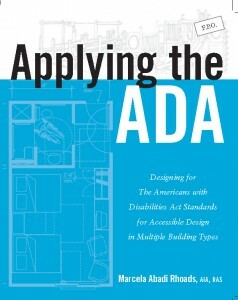 In the new ADA there are residential scoping and technical guidelines. But these guidelines only deal with Federally funded housing, residences in places of education or social service establishments that have dwelling within. 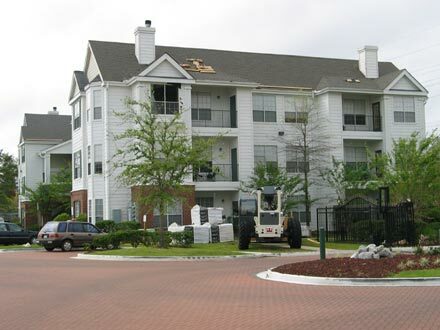 Other residential facilities, do not fall under the ADA, but Fair Housing or Model Codes. 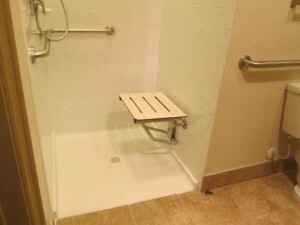 There are four types of residential projects, but only two are required to follow the ADA Standards. 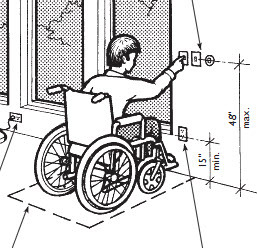 This newsletter will explain single and multi-family housing that are not required to meet ADA Standards. The Fair Housing Act requires that any multi-family project be made accessible to the disabled community. Therefore the owner of a multi-famly property cannot discriminate against a family or individual who is disabled on the grounds that the property is not accessible. 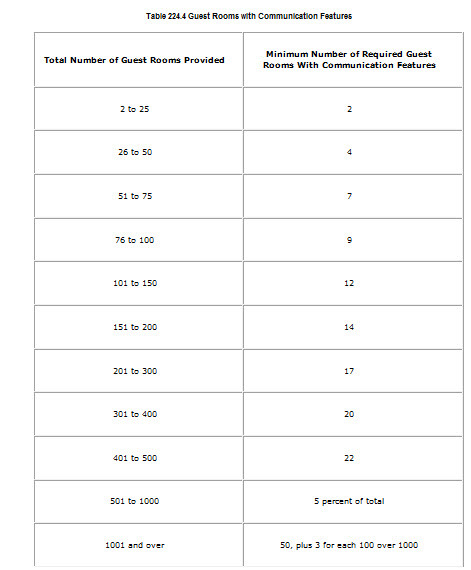 ALL multi-family housing projects are required to be accessible per the Fair Housing Act. 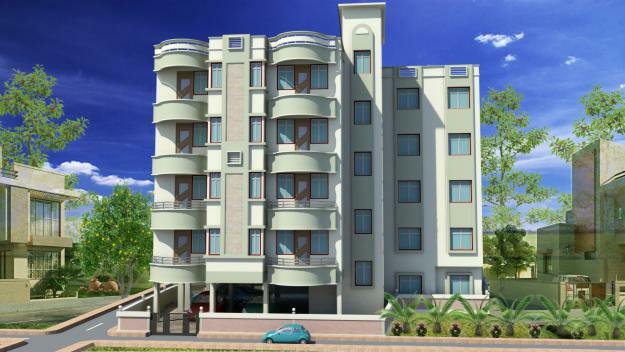 This includes apartment complexes, and even condominiums as long as there are four or more units in the property. Building code and ADA does have percentages for how many units are required to be fully compliant vs. adaptable, but fair housing does not. Therefore all units must be designed using the minimum guidelines listed below. 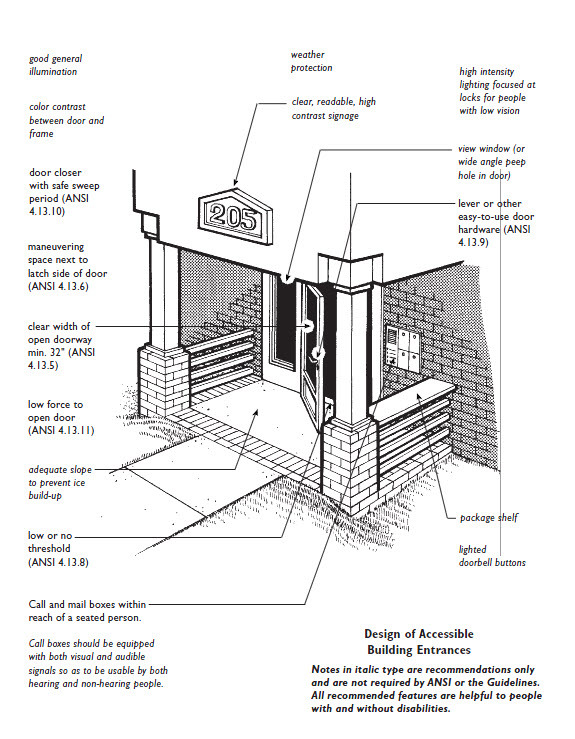 2) Accessible and Usable public and common use areas: Places such as parking lots, mail boxes, recreational area, lobbies, laundry areas, community building must be accessible and usable. 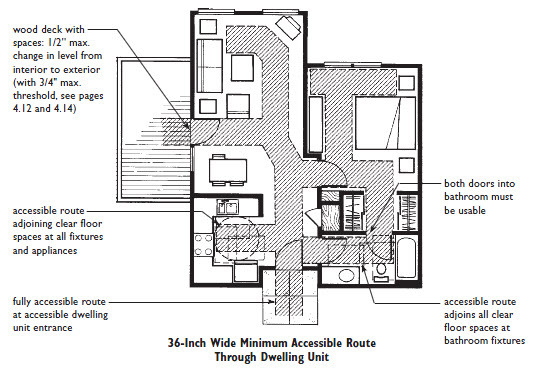 Single family homes, duplexes, triplexes and multi-story townhouses are not required to be accessible by any accessibility standards. Therefore any single family home development are essentially exempted from having to be accessible to the disabled. 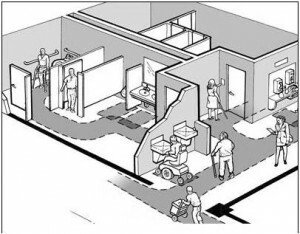 A new movement called “Aging in Place” are advocating for remodeling or retro-fitting homes in order to make them more usable to the disabled and more universally designed so that families can stay together as they age. 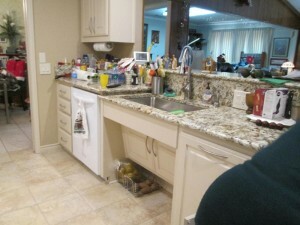 Below are some of the enhancements we did in a kitchen of a family with a disabled mother and son. It is also good for their able body husband. 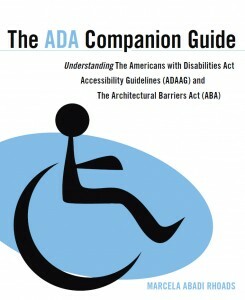 If you want to learn more about the new Standards, The ADA Companion Guide explains the 2004 ADAAG Guidelines with commentary and explanations throughout. The 2004 Guidelines were adopted by the DOJ to create the 2010 Standards and by Texas to create the 2012 TAS. This book explains the technical requirements for both. The Texas Department of Licensing and Regulation regulates the Architectural Barrier Act and the Texas Accessibility Standards in Texas. They also issue memos that explain certain ambiguous terms and concepts in the Standards. They have issued four so far to explain the 2012 TAS. This newsletter explain them. 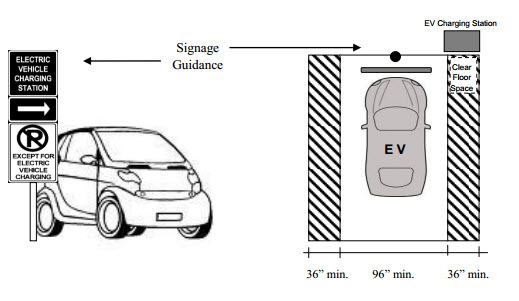 The Technical Memorandum TM 2012-01 has requirements for Electrical Vehicle Charging Station. 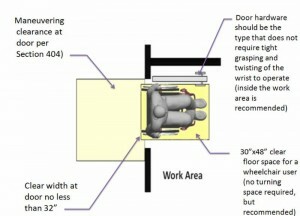 The vehicle space(s) with the accessible charging station shall be at least 96 inches wide and shall provide a 36 inch wide (minimum) accessible route complying with TAS 402 on both sides of the vehicle space to allow the user adequate space to exit their vehicle and access both sides of the vehicle. Striping of the accessible routes is recommended but not required. 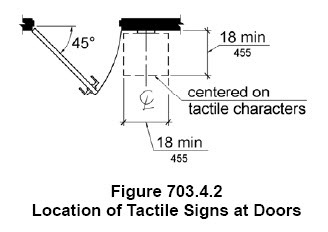 Directional and informational signage complying with TAS 216.3 shall designate the location of the accessible charging stations. The symbol of accessibility is recommended but not required. Crew quarters that are used exclusively as a residence by emergency response personnel and the kitchens and bathrooms exclusively serving those quarters shall comply with the requirements of 233 (including 233.3.1) and 809 for residential facilities and residential dwelling units. All other common use areas, elements, and spaces, including, but not limited to, parking, drinking fountains, public restrooms, meeting and training rooms, and conference rooms, shall comply with the 2012 TAS. 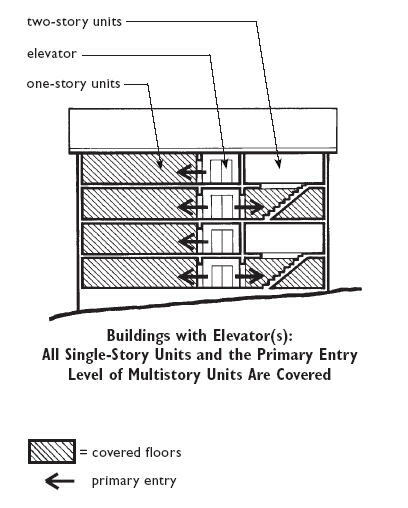 Multi-story buildings and facilities shall comply with the accessible route requirements found in 206.2.3 unless exempted by 206.2.3, Exception 2, which states that in a public building that is less than three stories with less than 5 occupants on the upper or lower story, an accessible route is not required. Truck bays, workshops, and other employee work areas, elements, and spaces used exclusively by emergency personnel for work shall comply with 203.9 and other provisions of the 2012 TAS applicable to employee work areas which state only approach, enter and exit is required. The Technical Memorandum TM 2012-03 explains what defines a shopping center or shopping mall and how this affects the elevator/accessible route exception. 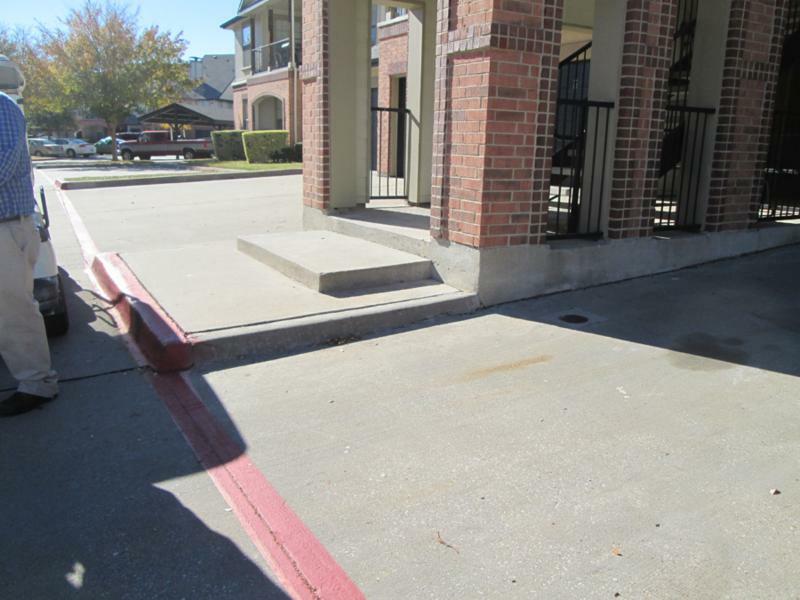 If a private building is a shopping center and has more than one story, an accessible route is required, no matter what is going on on the second story. But there is an exception if it is a retail space in a one story building with a mezzanine. A free standing store, like Walmart is not a shopping center and therefore a mezzanine may not require an accessible route if it meets all the criteria on 206.2.3 Exception 1 or 206.2.4 Exception 3. 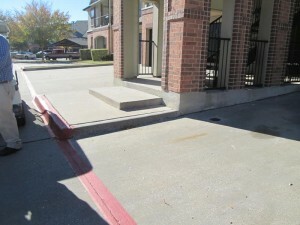 This photo is of a retail story with a second story and it does require an accessible route to the second story. Square Feet. The reference to “square feet” shall mean gross square feet. Per Story. The term “story” is defined in 106.5.64 as that portion of a building or facility designed for human occupancy included between the upper surface of a floor or the upper surface of the floor or roof next above. A story containing one or more mezzanines has more than one floor level. Therefore, based on 106.1 and the indicated meaning of “story”, the reference to “per story” shall also apply to the first story when calculating square footage. These clarifications have been confirmed by the Department with the U. S. Access Board and do not constitute a substantive change to the compliance requirements of 206.2.3, Exception 1. 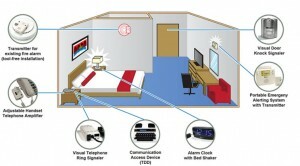 In the 2010 ADA and the 2012 TAS there are certain elements that require front approach and parallel approach. But not all of those also require for them to be centered along the element. This newsletter will enumerate the one’s that do. Other elements such as lavatories and sinks and operating mechanisms only require forward approach but it is not required to be centered. 602.2 Clear Floor Space. 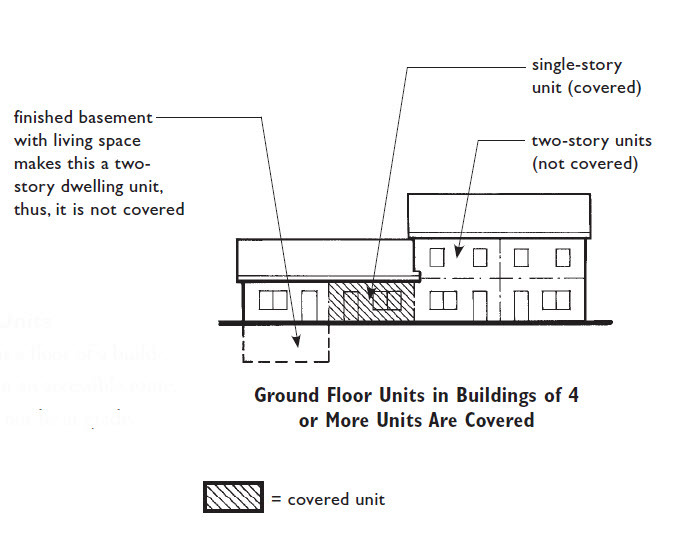 Units shall have a clear floor or ground space complying with 305 positioned for a forward approach and centered on the unit. Knee and toe clearance complying with 306 shall be provided. 611.2 Clear Floor Space. 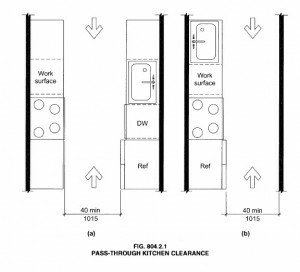 A clear floor or ground space complying with 305 positioned for parallel approach shall be provided. 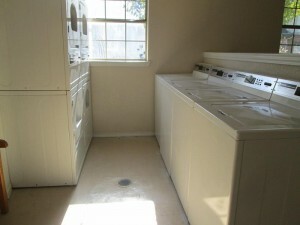 The clear floor or ground space shall be centered on the appliance. 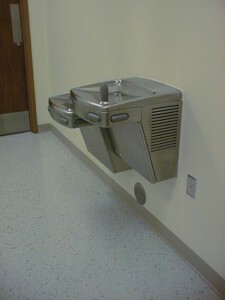 This sign has a drinking fountain in front of it, therefore the requirement for a clear floor space centered on the sign has not been met. 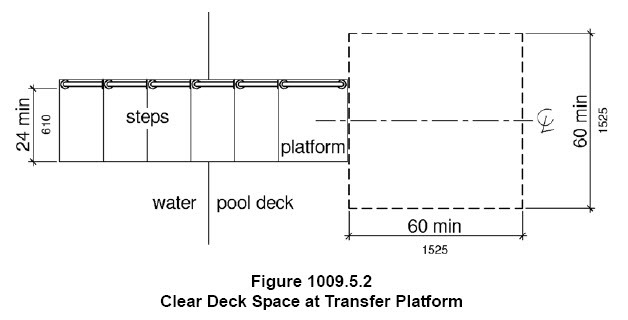 804.3.1 Clear Floor or Ground Space. A clear floor space complying with 305 positioned for a forward approach shall be provided. The clear floor or ground space shall be centered on the kitchen work surface and shall provide knee and toe clearance complying with 306. The following elements are required to have a forward approach, but do not require it to be centered. The following elements are allowed to have a parallel approach, but do not require it to be centered. 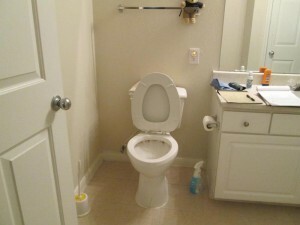 Photo: The range can have a parallel approach, but the sink requires a forward approach. Photo: This kitchen has a built in microwave but NO cooktop, therefore it can take the exception for parallel approach at the sink. NOTE: Our offices will be closed October 1 and 2nd and again October 8th and 9th for religious observance. The Texas Department of Licensing and Regulation issued a bulletin that explains when this exception can be taken and when it cannot. This newsletter will explain it as well. Does my sink at my break room have to have a knee space? 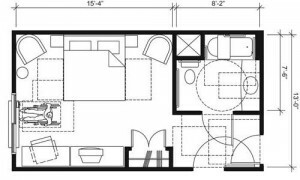 – Kitchen: A place (as a room) with cooking facilities. – Kitchenette: A small kitchen or alcove containing cooking facilities. – Wet Bar: A bar for mixing drinks that contains a sink with running water. 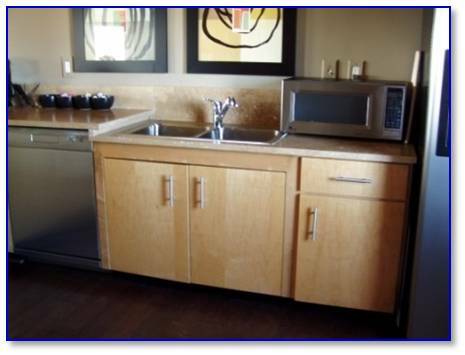 – Cooking Facilities: Fixed or built-in range, cook top, oven, microwave, or convection oven. So, if a break room has “cooking facilities” within, then it is a kitchen. This break room has a microwave on top of the counter. 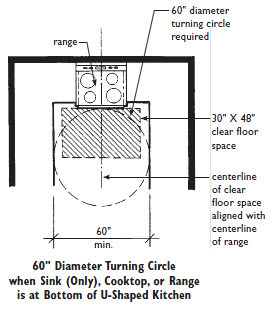 This is not considered a “fixed cooking facility”, therefore this space is not a ‘kitchen” and the sink will require a knee space. 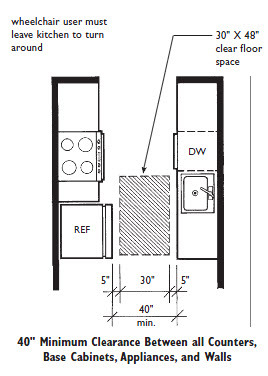 If our space is not a true kitchen based on the definition, then if there is storage located within, it must comply only with Scoping 225 which says that at least one of the storage units must comply with 811 and be within reach range. This is important, because if we truly have a kitchen, there would be many more requirements associated with them. See the next entry for those. This is an important one! 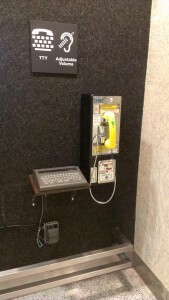 In order for this to be able to be compliant, the shelves must be within reach range. Which means that if a kitchen has upper cabinets and base cabinets, the number of linear feet of shelving must be the same for the non-accessible ones than for the accessible ones. 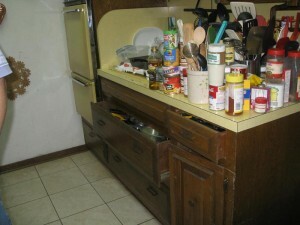 This could be problematic since at the base cabinets there is typically appliance, knee spaces and no shelving. 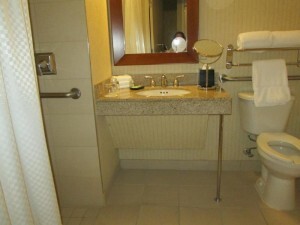 Another location where a knee space at a sink is not required is at wet bars. Wet bars are defined in our first entry, but it is a place where drinks are mixed. 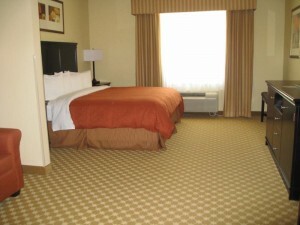 They are typically found either at hotels and other transient lodging places or sometimes even at waiting rooms. According to TDLR, a break room is not a wet bar. 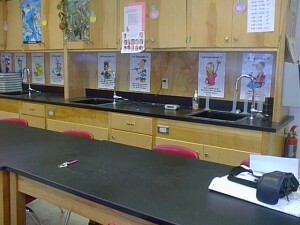 The other sinks that must follow the scoping of 212 and the technical requirements of 606 are common use sinks such as science labs at a school. But sinks that are not common use, but are part of a work area and are only used for work related activities are exempted as a “work area”. These are located in teacher workrooms, back of bar at a restaurant, or commercial kitchens. 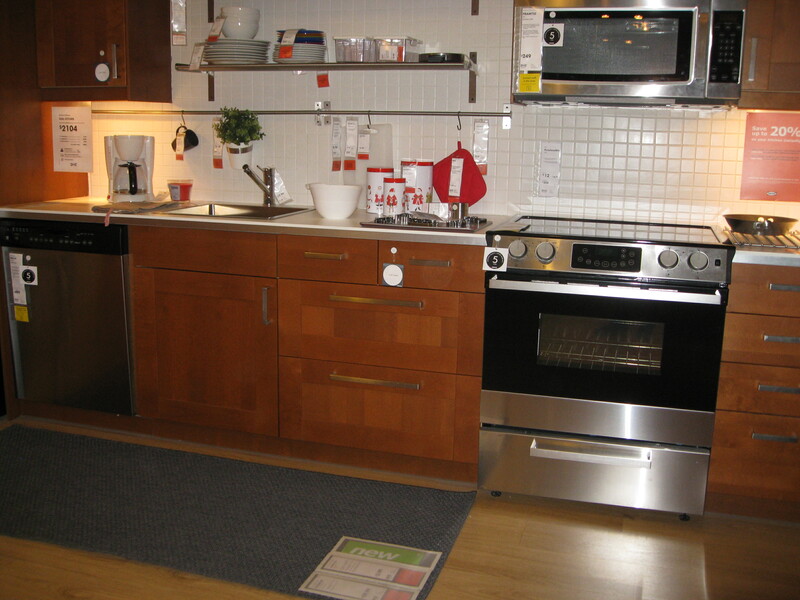 – Cooking Facilities: Fixed or built-in range, cooktop, oven, microwave, or convection oven. 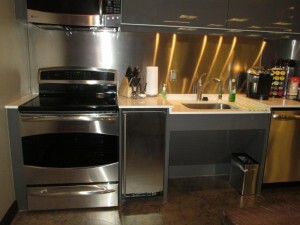 -Built -In Appliance: When cabinetry design or location of utilities (ie. gas supply or 220V electrical outlets) creates a dedicated shelf or space for the appliance. For purposes of compliance with 212 and 804, the terms “kitchen” and “kitchenette” shall be used interchangeably. 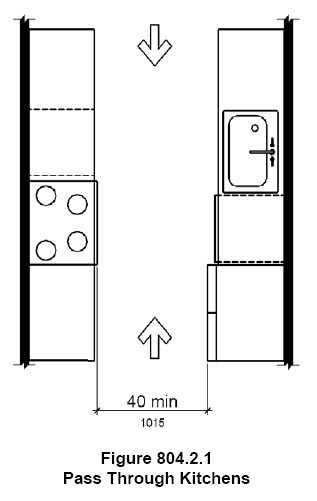 With Cooking Facilities: A room or space with at least one fixed or built-in cooking facility is considered a kitchen/kitchenette and shall be subject to compliance with 212 and 804. Storage required by 804.5 shall be calculated by linear feet. 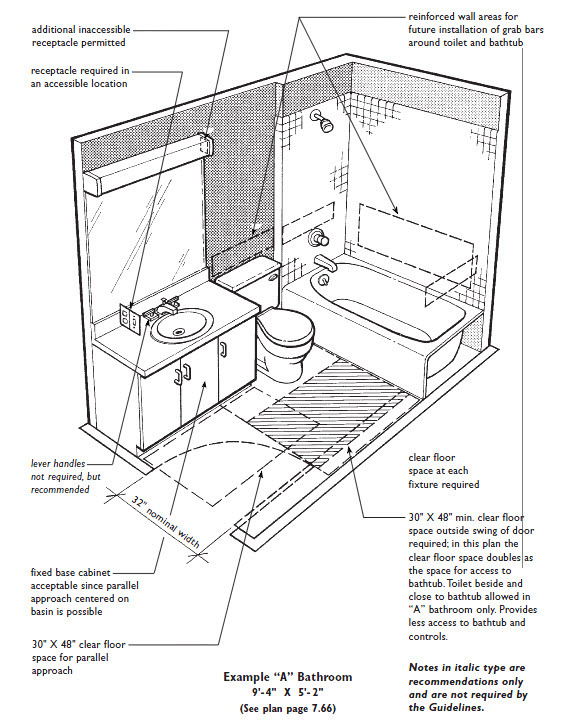 These are the technical guidelines for kitchens in common use spaces, residential dwelling units and transient lodging spaces. 804.5 Storage (in kitchens): At least 50 percent of shelf space in storage facilities shall comply with 811. This is measured in linear feet. According to TDLR, the photo above would be considered a kitchen with cooking facilities because there is a built in range and built in microwave. 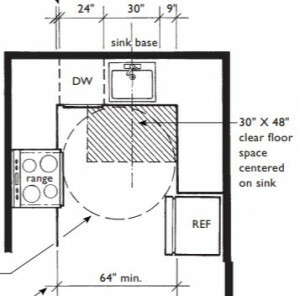 Therefore the sink would require a knee space per section 606.2 and be at 34″ high max. 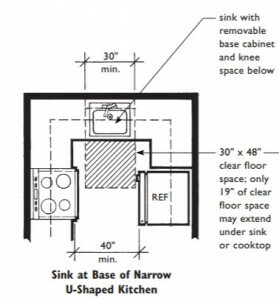 If the same kitchen had a fixed oven only, or a fixed microwave only without a cooktop, then it would still be a kitchen but now the sink would NOT require a knee space. Without Cooking Facilities: A room or space without a fixed or built-in cooking facility shall be subject to compliance with all applicable provisions of TAS based on the elements provided. 606.2, Exception 1 shall NOT apply to sinks provided in spaces without cooking facilities unless it is a wet bar since this exception is applicable only to kitchen sinks. 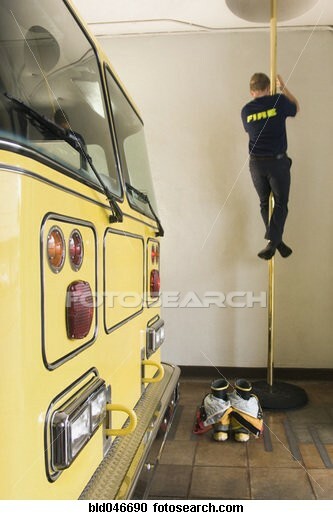 Storage provided shall comply with 225 and 811.
and knee and toe clearance complying with 306 shall be provided. cook top or conventional range is not provided and to wet bars. (c) the walls behind and surrounding the cabinetry are finished. counter surface is 31 inches (785 mm) maximum above the finish floor or ground. by children 5 years and younger. 6. The dip of the overflow shall not be considered in determining knee and toe clearances. 811.1 General. Storage shall comply with 811. 811.3 Height. 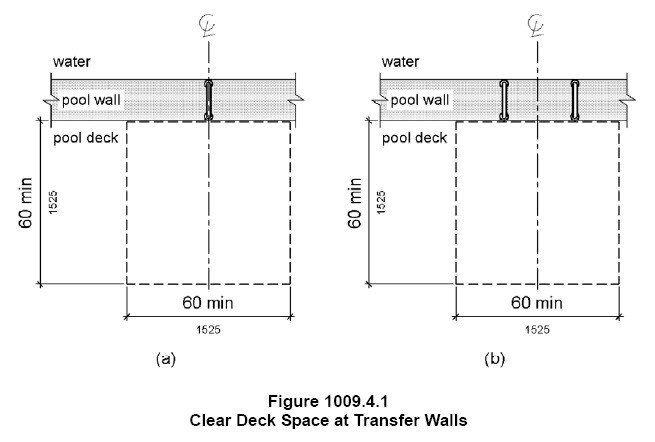 Storage elements shall comply with at least one of the reach ranges specified in 308. 811.4 Operable Parts. Operable parts shall comply with 309. 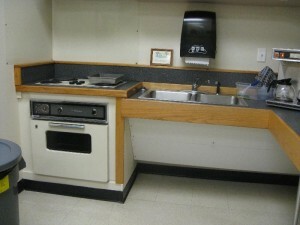 The photo of the sink above shows a sink that is not located at a kitchen as defined by TDLR since there is no “fixed” cooking facility. We see the microwave but it is not fixed. 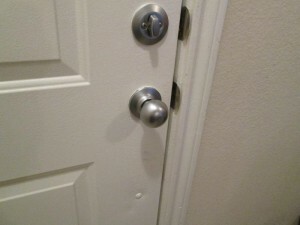 Therefore a knee space is also required at this location. 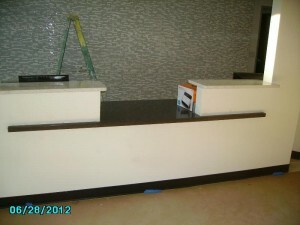 Wet Bars: A bar used for purposes other than drink preparation is not considered a wet bar. 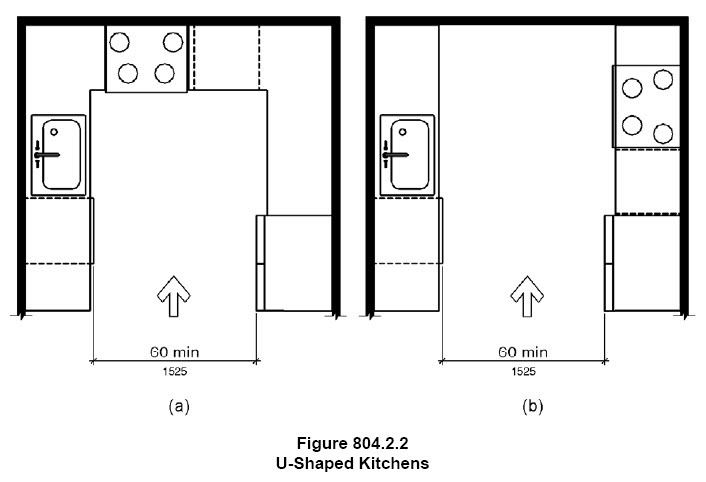 Summary: Kitchens, Kitchenettes, and Comparable Spaces. 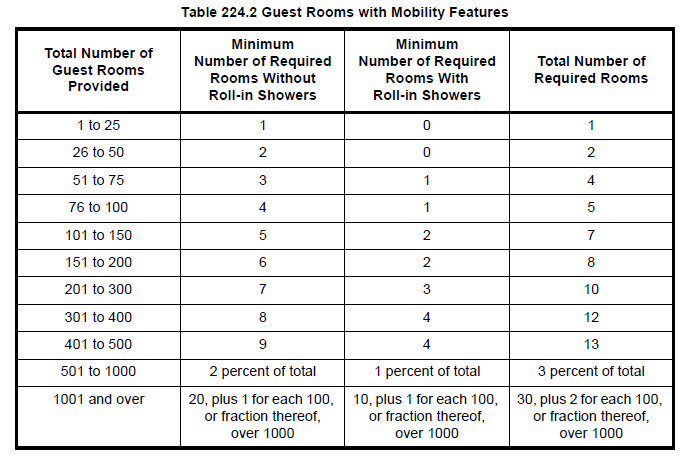 This table explains when and how many kitchens are required to comply. 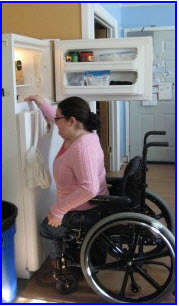 Basically, kitchens and ktichennettes in common spaces, must comply with sections 212 and 804 of the 2012 TAS (as well as the 2010 ADA). 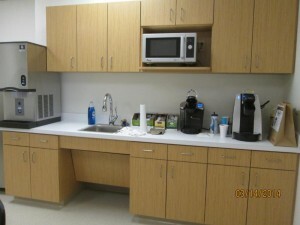 Kitchens at work areas do not have to comply. 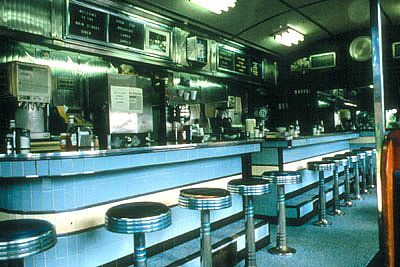 These are commercial kitchens or kitchens used for work purposes. 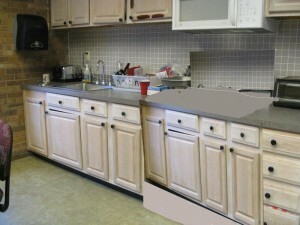 Some kitchens require a separate work surface with a knee space but only at residential and transient lodging places. Storage not in a kitchen (such as a break room without a fixed cooking facility) will have to comply with 811 and only one of each kind will have to comply. 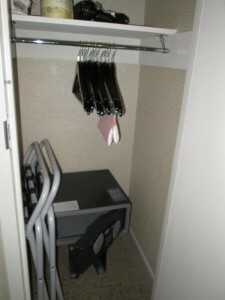 Storage in kitchens at residential and transient lodging do have to comply with the 50% rule. For facilities without cooking facilities within and in common use spaces, residential dwelling units and transient lodging, are not considered kitchens. Therefore if they have a sink they must comply with the requirements for sinks listed in 606.2 and are not subject to Exception No. 1 unless it is a wet bar. They also would not be subject to the storage requirement since they are not kitchens. Break rooms are good examples of such facilities. They are not kitchens because they don’t have a built in cooking facility, but must comply with the requirements for sinks.